In this passage the "sons of god" refer to the (disobedient) angels. The giants (or Hebrew nephilim) are understood to be their hybrid offspring from women. You don't get giants or "heroes of old " (legends, mythology) when both parents are human. But you could if one parent was super-human such as an angel. Jesus interpreted his own parable to literally depict that the Devil had offspring, just as Genesis 6 implies. These offspring look human just like the righteous humans do and are undetectable to anyone as counterfeits except to angels who themselves are spirits and can see and identify other spirits. The holy angels will only collect the tares "at the end of the age" to be "burned in the fire." That fits how the Beast and False Prophet are thrown in the lake of fire at the end of this current pre-millennial 6000 year age. Follow Up Question: "Isn't the Separation of the Sheep from the Goats at the start of the Millennium?" Assuming that the Antichrist is still God’s creation (by-proxy), then does this entity have any free will to choose it’s own destiny? I mean that’s a pretty bad deck of life to be delta with to be created for the sole purpose of eventually being tormented in Hell for eternity. 1# Is the Antichrist a human with a soul to be saved? 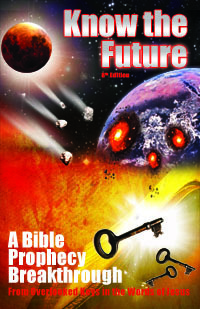 John, If prophecy says something is to be destroyed, then “IT IS WRITTEN” as they say. It’s not changing. America is going to burn. The Antichrist is going to burn. As the article argues, he’s not even human, but an evil abomination of demonic spirit and human-like flesh that perhaps has an evil nature that will not repent and submit to God’s rule. See /next-in-prophecy for more on how he was made by fallen angels and is not an angel himself. Yes, you’re absolutely correct: God Almighty has judged the evil one to be incompatible with the overall aspects of His kingdom, and therefore he be destroyed in the lake of fire reserved for him and his angels. There’s very definitive biblical support for the foregoing. No need to enumerate here. This man that is used for antichrist has no choice , he is used like a door nob and it is not fair to be used and no chance for salvation can he be saved threw the ‘lake of divine purification or the lake of fire? I certainly cannot fathom all the sympathy for the “poor anti-Christ” (means opposite of Christ, evil personified) who has no choice or hope of salvation. God’s ways are higher than ours, He is ruler of the Universe and all creation. He can do what He wants with any being without having to consider one of His creations thinking He is not playing fair! The only boundary that the Lord has is that He cannot go against His character. Your “unfairness” is coming from your limited knowledge and is not like the Almighty’s. Moreover, brother Tim McHyde’s literal system of reading “at face value” the New Testament is clearly supported by other Scriptures in the Old Testament as well. One needs only to look in the aforesaid biblical dictionaries I alluded to above. Yes, you can “take to the bank” Tim’s honest reading of Scripture! He is not dependent upon “lobbyists” or mega supporters, like “mega pastors” are! They can bend, stretch and embellish scriptures…but not the honest pastor Tim McHyde! 13He replied, “Every plant that my heavenly Father has not planted will be pulled up by the roots. We must remember Lucifer, the start of all this trouble, made a choice to defy and set himself against The Most High Father, Adonai or Abba. That choice was his. It is surely no good to have us as automatons who do whatever Abba says as robots. We are created with free will. Lucifer exercised his free will. He has not repented but insisted in working evil and we see the result of that here today, and historically. There are those that follow Lucifer, worship him they made a choice as well. If you decide to defy the Father, what has been promised to you? What do you expect the Father will do??? David, I understand Lucifer was an angel and angels cannot exercise freewill like we humans. How come you’re alluding to freewill for angel? Gabriel Obaji, i’ts pretty late where i live so i’m just gonna say that you are right and wrong at the same time. Yes, it is true that angels cannot exercise free will but that is not true for all of them. We know for sure that lucifer had free will. In the first place logically speaking if he wouldn’t have had free will he couldn’t have rebelled against God. Just like my OP system can’t rebel, except if he bugged out ;)) but i doubt that. Tim, please check this out. When I began to listen to the interview, I stopped shortly in, and googled the woman whose testimony was going to be the basis for it. The link above seemed to be the most comprehensive and factual of the ones I read. I realize any and all of this can be disinformation, however, there is enough here to suggest this may not be the most credible of sources and not someone you want to endorse or imply endorsement of by including it on your site. I have always found your writings to be factual, level headed, and the best around. when it comes to end times as you are Biblically based and literal. However, including this Icke interview doesn’t appear to fall into that category. I can see the logic and possibility of “tares” being a non human race, however, this particular interview does not support that in any tangible way, It is heavily based on someone who later retracted her stories and whose stories seem pretty wild and changing when you compare them over the years. It may not be helpful for you to include something like this interview in your article. It does not surprise me in the least Arizona Wilder has retracted statements and contradicted herself. This is the nature of DID people. I’ve known a few. They can even be programmed to hide or doubt what they experienced or know. It’s possible this programming kicked in or she’s just a mental mess from the alters and splits. The thought that also crossed my mind as I read the page and your comments of concern is what would constitute a “helpful” and “credible” witness to give us a testimony on tares being among us. Bear in mind that this is one of the greatest secret of Satan that he wants to keep under wraps (as Icke calls it I think, “The Biggest Secret”) And further, what are the chances of us ever getting such a witness? I’d say zero. Therefore, is it really helpful to suppress any testimonies of tares we do have just because they don’t live up to normal standards of credibility? I’d say no. I believe if you think about it, it’s astounding that we have anyone at all coming forth on record to testify that there are non-humans among us and that the leading Antichrist candidate is one of them just as Revelation 19 strongly implies he must be to qualify. That’s why I find this interview helpful and the questions of credibility not a factor. Remember, I was not looking for confirmation of tares or Prince Charles being non-human when I stumbled upon this information. When I first saw it, I doubted the testimony like you do. Then years later I saw the Bible said exactly what she was saying on both points (tares and the Antichrist/Prince Charles being one of them). That’s why I feel it’s important to leave this interview up. Tares and the Antichrist being one are a fact and this woman is confirming it in a very unprompted specific way. It’s astounding! Tim, Your response very much makes sense and helps. I love how you think… very logically without the emotional “name calling, etc” response I often see. Like you, I am weighing all that I read, both in the Bible and elsewhere and I find it very helpful when I find someone like you doing the same and really THINKING. I agree with you that anyone who went through the experiences this woman claims would have a bizarre story, so of course that makes it hard to sort fact from fiction. What I also know is that based on the Bible, it certainly is possible that this is more fact than fiction. My reason for writing my comment is that I respect you so much I didn’t want you to lose any credibility by posting this interview. You sound as though you have weighed that, however, and I respect your reasons for keeping it up. Please keep up the good work; I am one of your subscribers as I believe what you do is worthwhile, and I find your articles well worth reading. Thank you for taking the time to respond personally. It was unexpected and very nice. Tim – Your reasoning here is interesting and has merit. It seems to support Arizona Wilder’s testimony. Isn’t that exactly what Arizona Wilder has been talking about? It’s seems like almost perfect match to her testimony. So Lady Gaga now believes Prince Charles is a reptilian. She said that she believes the reason for Prince Charles shapeshift was that he wanted to display power, but the reason for his shapeshift according to Arizona Wilder’s testimony may be Lady Gaga herself. Lady Gaga is young and fertile…maybe it reminded him of young Lady Diana ? Arizona Wilder mentions menstruation as something that triggers reptilians to shapeshift uncontrollably. First look at the Gray Pope Pepe Orsini the Jesuits have controlled the world for a long time and were behind JFK’s murder and Princess Diana. Putin is not an enemy he recently sent the Rothschild banking cartel packing out of Russia along with their world Illuminate banking cartel. Hillary was suppose to be in to get us into war Russia and or the middle east. Believe Heavenly Father had another idea and Trump is in to do the Fathers will even if he doesn’t understand he certainly is being prayed over. Remember Yahweh wrote this book he is the author and the finisher. The Nephilim are here in various forms and work through various government and organizations, Masons, Jesuits, Illuminati to name a few. Our destination is to be purified by Yahs fire which is the word and his tribulation to purify us as Sons and Daughters of the most high Elohim! Remember in Joel he will pour his spirit upon us. His glory is to come. Pray you are ready to be part of his renment. Shalom in Yashua. I understand that a person who has an angel and human as parents would be classified as “nephilim”. However, what about offspring of nephilim (a nephilim and 1 human parent)? Are these people nephilim too or are they fully “human”? If so, then what’s the generational cutoff for being nephilim? Finally, since nephilim aren’t people then the instructions of God (the ten commandments) don’t apply in their case, correct? Zachary, great questions. Let me know if you find any solid answers =). I don’t know the answers either, but I’ve been paying more attention to which of my longtime acquaintances have softened into coming to faith in Jesus and which others have hardened, and how this relates to their genetic heritage now that DNA services have made genealogy more popular. Two people I know who are exemplars of the resistance to Jesus can trace their lineages to elite bloodlines. They denounce conspiracies that involve those bloodlines, and I don’t think they’re part of the conspiracies; they’re just not able to perceive them. I think saving faith is more remote for them, and I’ve stopped praying for them. But they seem perfectly human to me, capable of choosing otherwise if they weren’t so blinded. If they have some nephilim ancestry, that supposes that many people could have a little, and God alone has the wisdom to sort out the mess. In the book of Jude it says that Sodom and Gomorrah suffer the vengeance of eternal fire. Also people who are twice dead and plucked up by the roots, indicating eternal darkness forever..Wouldn’t this indicate eternal judgement already for them and they are already in the lake of fire? So the AC and false prophet are eternally judged at the Lords return and are cast into the lake of fire. They are still there, dead, judged eternally, when Satan is also cast in. Floyd, Jude is unclear what it means about “examples of eternal fire” as the fire is obviously out at Sodom and Gomorrah today, not eternal, but it sure did destroy everyone and everything alive it fell upon like the lake of fire will. It’s important to note that just because a fire is eternal does not give eternal life to the thing you put in that fire to suffer eternally. We know nobody is in the lake of fire yet since Jesus has not returned (Rev 19) and the Great White Throne Judgment has not happened (Rev 20). Also, “twice dead” is part of a figurative passage, not literal, and unclear. Therefore, nothing in Jude contradicts that the B & FP get burned up in the lake of fire when thrown in and are no longer living when Satan is thrown in 1000 years later. It’s unclear in the Greek and I sure wish we had the original Hebrew Revelation to settle that one. Finally, I don’t think God is a sadist who tortures life he created forever for their rebellion. My thinking was that to be cast into the lake of fire was to be eternally judged and therefore annihillated, not tormented. But they suffer the vengeance of eternal fire because there is no chance for living again. Something that is burned up is gone forever. I agree that eternal punishment doesn’t require that a person is alive forever. The fact of having ceased to exist is an eternal state of punishment. I am still reviewing the Bible to make sure I haven’t missed something; but it seems to me that when it says the wicked will be destroyed, they really will be destroyed; and, the gift of eternal life is the gift of eternal life as opposed to eternal non-existence. I am a pretty literal, straightforward person, so I could be missing something subtle. Have you read Judgement of the Nephilim? https://www.amazon.com/Judgment-Nephilim-Ryan-Pitterson/dp/0999208306/ref=nodl_ I don’t agree with everything but the author tries to clearly map the rise, fall and future rise of the Nephilim using the Bible as the main source and extra-Biblical if it supports the Bible. I appreciate any work that puts the Bible as the source of information above tradition. Just curious if you have read it and what your thoughts were. Elizabeth, it has some good insights, but it’s incorrect to tell people because of Matthew 24:37 that we need to worry about Nephilim filling the earth again, which entirely misses the point of that passage. Nephilim come out of the abyss in Rev 9 and work for the Antichrist, but it’s a distraction to watch for or worry about nephilim as we’ll already be told to flee before them, the Antichrist and the mark. The Nephilim are the genetic offspring of angels and humans. The Nephilim are not coming out of the Abyss. The fallen angles who made them are coming out. The Nephilim were on the earth post-flood so it couldn’t be the fallen angels. The Nephilim gene came on the boat through Ham’s wife most likely since the giants aka Nephilim were descendants of Canaan. Is the Nephilim gene still on the earth. Probably but extremely diluted so it makes no difference. The days of Noah and Lot were known to be evil and both times were written down as genetically corrupted by the Nephilim gene. Sodom and Gomorrah were descended from Canaan. Will the released fallen angels try to procreate with humans again? If so they won’t have enough time to make a difference. I agree that the days of Noah and Lot ultimately point to how evil the last days will be plus how God will judge. Regardless of what happens, we don’t need to fear it if we escape to the place prepared. I just thought the book answered a lot of questions people have and provides insight like you said. Thanks Tom for your precious insights. Let me also relate here certain things the Lord has been revealing to me about the identity of the Antichrist. First one was in 2012: I dreamt that the world ended or so, and everyone was forced into a queue by armed men, marching them to a concentration camp so that their names could be written down. Then I met the man that these soldiers were working for: HE WAS A MUSLIM. But as at then, I guess I was too ignorant and naive to imagine how Islam would fit into the theory of the Antichrist. So this question stayed on my mind. And so for a long time now I’d been thinking about the Antichrist; I looked at the growth of the world’s Islamic population and I thought, remembering my dream in 2012, that maybe the Antichrist would be really Muslim, considering that it is (radical) Muslims who really hate Jews and christians, and the Antichrist would actually set out to hurt Jews and Christians. I still struggled with the theory. But I had to settle it in my heart that the Antichrist would have some Muslim background or connections. Before the dream in 2012, I had always thought that the Antichrist would be from the Roman Catholic Church. I was in a dream and was watching/reading the news (this experience was as though I was both reading the news and standing in the place where the news happened), and I saw, in the British House of Lords/Commons, a motion moved against Jesus Christ Himself. The motion brought up accusations and blasphemy against Jesus Christ. Nobody said anything in defense, and it appeared everyone in the British House was in agreement or support. Then a man who had great authority in the British House, presumably the head or speaker for the House, stood up and spoke words to agree and endorse the motion moved against Jesus Christ. This man spoke words that delivered a verdict against Jesus Christ and His Church in the British House, and this man’s words were like final authority. After I had this dream, I began to say in my heart, “The Antichrist is coming up out of the United Kingdom, precisely from England.” It is the search for any information as to whether any other person thinks the same way that brought me to your website. We’re living in the days of revelation and God is revealing things so that His children would be advised. The world won’t get better, Christians only need to get stronger in faith to withstand in these evil, last days of the earth. BONUS: I also believe a nuclear war is coming that will seriously paralyze the USA. Still in the year 2012, I dreamt that I saw Russia stand on something like a hill and the USA was standing in something like a valley. Russia had a big fire and on this fire, they had a very large pot in which they were heating water. They heated this water until it was very hot and they turned the pot over so that the hot water could pour down the valley, and it was pouring down towards the USA standing in the valley. Then about two weeks ago also, I also dreamt that I was with President Trump, and he was told me that there would be a war in 3 years, that a nuclear bomb would be used and there would be much destruction. He also told me the world had been divided into 3 regions: North, Central and South. We live in fearful times. May God strengthen His people. Ugo that man in the British House of Commons who spoke for the motion reminds me of one person who has influence on British government despite supposedly being neutral. Prince Charles of Wales. Not saying he is the Antichrist, though his history of government lobbying along with his beastly coat of arms and gematria make him an interested candidate.